Green roofs and solar power – often referred to as Biosolar roofs – is smart green infrastructure. There is a perception that a roof can either have a green roof or solar power but not both. This is however not the case. Combining the two technologies is common in many countries in the world. Switzerland, Germany and Austria lead the way in the approach. A biosolar roof generates energy as well as providing all the benefits of a green roof. but in fact, both systems can benefit each other too. Solar/Photovoltiac panels can work more efficiently on a roof when installed over a green roof system. The micro-climate around the panels is important. If it is too hot, the panels can lose efficiency. The green roof element can have a cooling effect, especially in summer. 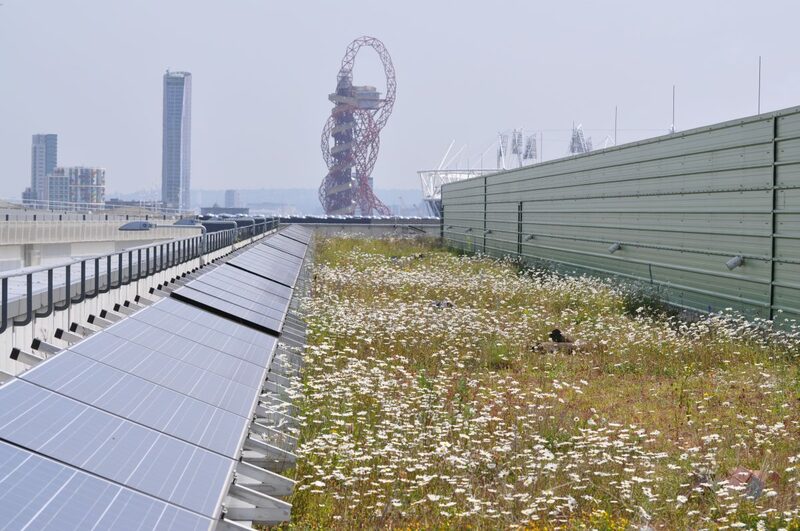 Year round, green roofs can help to keep ambient temperatures around the panels at or near 250C. This is the best temperature for solar panels to work most efficiently. A green roof makes the installation of A-frame panels easier. The green roof element provides the ballast to hold the A-frames and panels in place. This means there is no impact on the waterproofing layer below. The PV panels should also increase the diversity of vegetation and therefore also fauna using the green roof. The panels can create shaded areas underneath, with rain run-off making damper areas to the front and drier areas behind. This creates a ‘habitat mosaic’, allowing a wider variety of vegetation to flourish, in turn attracting a wider range of butterflies, bees, beetles and other species. However, if biosolar roofs are not design and installed correctly, things can go wrong. All too often, solar panels are seen as the important element. They do provide energy after all which has a clear financial value. But if the green roof is just treated like window-dressing around the panels. the positives mentioned above can quite easily turn into negatives. The image above illustrates the problem, where panels have been placed too close to each other and the wrong kind of plants have taken over. 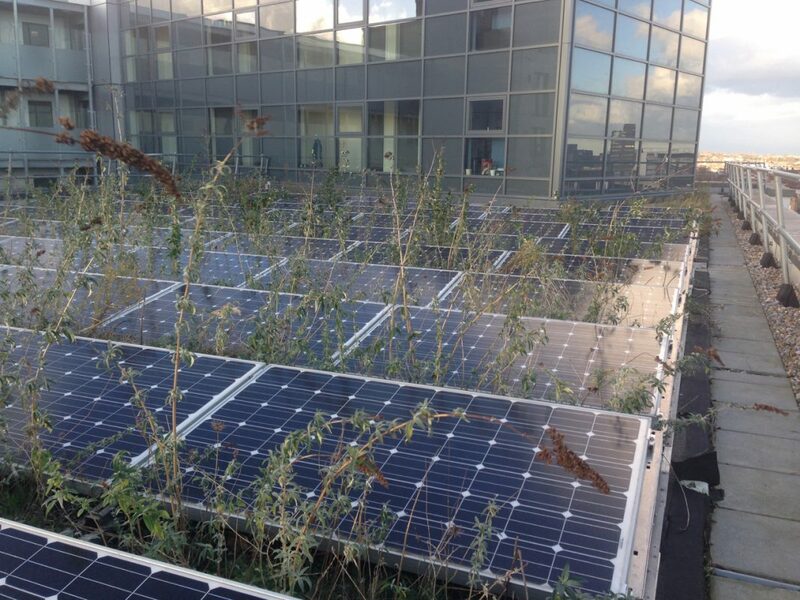 There are a number of exemplar biosolar roof projects around the world that combine green roofs with solar energy. In London, the roof of the Olympic Park Media Centre in Stratford is one. Standard Chartered Bank’s biosolar roof in the City is another. With an increased interest in solar energy on roofs from the current Mayor of London, such projects are likely to increase. 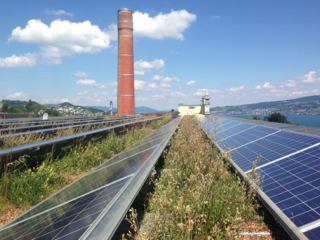 In Switzerland, there are biosolar roof projects throughout the country. The Messe Hall in Basel installed in 2000 was one of the first. It is also one of the largest solar roofs in the country. In Germany, many green roofs combined with solar panels are found in Freiburg and elsewhere in the country. It will be interesting to see what happens in France, now there is a national law to encourage solar and green roofs. Whether this leads to more biosolar roof projects is to be seen, as the law is ambiguous on whether they should be combined together. Sadly, architects all too often choose to separate the two technologies on a roof. But with pressure mounting to meet renewable energy targets and create resilient cities, green roofs with solar energy generation are surely part of a smart future for cities.